Being a relevant part of today’s 21st century business world is no easy task at all. This is especially because there is so much competition between the various companies and employees have to bring their A game at all times and under all circumstances. However, this having been said it is important to note that another thing which makes working so tough is the intense rivalry that comes between co workers as everyone is trying to get ahead. In the event of having a troublesome co worker, here is how you can go about telling you boss about your issue. How to Deal With Difficult Coworkers at Work Without Losing Mind? You might have heard the famous quote “one bad apple spoils the whole bunch“. The reason why I have mentioned this quote is because it works the same in the case of employees too. Hiring a bad employee surely costs the organization negatively is a well-known truth. But on the other hand, good employees work very hard for the organization’s growth and development, also they turn out to be an asset for the company. Working with toxic employees or coworkers is harmful as it can affect your productivity and also increase the stress at work. It becomes even worse when working with a toxic lead or manager. The work culture also gets affected when you have such people around. So the best way to overcome such issues is to speak to your boss about the employee and request them to take action accordingly. In the event of deciding to take the matter to your boss, you should ensure that you have prepared well in advance exactly what points you would like to touch upon, pertaining to the co-worker. No matter how good you are at public speaking or thinking of ideas on the spot, you should not appear before your boss unprepared as you might end up saying something inappropriate. Another thing which you ought to do before you enter your boss’s office is to consult your friends, they are likely to give you good advice about what you should say and what you shouldn’t. At some point of time or the other everyone has had to deal with troublesome co-workers, so do not get too worried as it is perfectly natural and once you consult your boss hopefully things do start changing for the better. Keeping things bottled up within you is certainly not an ideal thing to do at all, as chances are that you will not be able to concentrate on the tasks which have been given to you. 3. Are you coming across as petty as well as childish? As we all know, today’s business world is a cutthroat one indeed and everyone is trying to get ahead and achieve success. Being career oriented as well as wanting to get ahead is no sin at all, yet at the same time, you should remember that at no point in time should you be trying to get ahead by steamrolling over other people. If you notice that someone is better than you, rather than trying to tear him or her down you should try and better yourself as you should always be in competition with yourself. When telling your boss about a co-worker, ensure that you have your bosses undivided attention otherwise chances are that he will not remember to take care of the matter at hand. In order to ensure that you are heard properly, you should take the trouble to schedule a meeting with your boss. If your boss is a caring one he will take out the time to listen to your grievances because after all, the boss is someone who has the best interest of his company as well as his employees at heart at all times. When you are speaking to your boss pertaining to any issue, you should ensure that you are speaking in a clear as well as comprehensive manner. When discussing about your co-worker, you should ensure that you do not beat about the bush at any given point in time and immediately address the matter at hand. You need to work on your body language as well as the tone of voice and should be in keeping with the subject which you are going to discuss and remember, if you do not take the exercise seriously yourself, then you cannot possibly expect your boss to take it seriously either. Now that you have scheduled the appointment with your boss you have to ensure that you are building a very strong case in your favour. However in the attempt of trying to make a strong case you must ensure that you are not telling any lies or uttering any falsehoods as whatever you are saying is going to be verified and if you do happen to tell any lies then chances are that your own image will be tarnished and you will also be labelled as a trouble maker. As long as you give a proper account of exactly what is troubling you, you need not worry at all. As mentioned above you have to make a strong case in your favour and one of the best ways to do this is by giving concrete examples of what happened and exactly when it happened as well. If you think that the event has been captured on the office CCTV camera then you can suggest that the boss takes a look at it as well. Companies are always on the lookout for employees who do their job well without any hassles and so your boss is sure to look into the matter and try to deal with it as soon as possible so that everyone can focus on their respective work instead. If there is a troublesome co-worker, then chances are that you are not the only one who is having problems with him and there are others too who are finding it tough to work with this individual. If they are willing you should ask them to come forward and testify as well, but ensure that you do not mention their names in their absence without their consent. Even if many co-workers do come forward at one time with this grievance, ensure that it does not come across that all of you are bullying this one worker, as that is bound to show you all in poor light. You should not forget to mention, that you are not someone who usually comes crying to the boss for every little small issue that transpires and state that the only reason you are here to complain is because matters have gone out of hand completely. State that you know that taking matters into your own hands isn’t possible and that is why the best thing which you knew you had to do was approach the boss. You should not shy away from stating that this person has made it absolutely impossible for you to devote your 100% to your work at hand. When recounting incidents or even putting forth your views, try and keep a cool head so that you show that you are not an unreasonable as well as intolerant person. At the end of the day you must remember that you are not speaking to any ordinary individual, you are speaking to your boss, so this having been said you should continue to maintain that professional distance and maintain the decorum which is expected of you otherwise you will not be taken seriously. No matter how flustered you get in the midst of the discussion you should try your very best not to make any personal comments at all, as the manner in which you talk will reflect how you are as an individual. Anything that happens in the office should be strictly professional and what happens in the workplace should stay in the workplace. No matter how the person is in reality or how the person chooses to live his or her life should not be any matter of concern for you. If you mention anything unsavoury you will land yourself in a fair bit of trouble. In addition to not mentioning any personal things you should also abstain from using any parliamentary or abusive language. If you know that you are in the right, then you need not resort to such low means as instead of getting the other person punished you will end up getting yourself punished. In the corporate world you have to constantly be careful of your words as well as your actions as anything wrong done or said by you could land you in a great deal of legal trouble. f you have done so, then do not forget to mention that often enough you have gone out of your way to mend fences and try and become friends with the other individual but he or she refuses to let anything go. Mention that you are someone who realizes that, for a company to function well all the employees need to work as one comprehensive unit and force. If there is even a little bit of negativity or hatred to one another, then the company will certainly not be able to function and over time things will surely get out of control as well and this is a nightmare for any company. When complaining to your boss about a particular co-worker, you must ensure that you do not end up ranting for hours on end reiterating the same point over and over again. Remember that in the business world, time as well as money, are both very valuable resources and at no cost should you waste either of the two. So get an appointment. State the facts, give concrete examples and then get out of there with a lighter heart and a head held high. You should remember that once you have given your complaint, there is nothing more that you can do, it is up to the bosses to do whatever they believe is correct for their company. At no point in the meeting should you give the boss any sort of ultimatum as chances are that it is certainly not going to go down very well with him or her. As we all know, bosses are skilled professionals who have a great deal of experience so once you have stated your problem, what you can do is politely ask your boss about how to go about dealing with this co-worker and if he was in your shoes what would he have done? Last but certainly not the least is that, you should state that you have no personal enmity or problem with the individual and you are willing to have an open discussion with the individual so that some solution can be thought of. Once the air has been cleared and the matter at hand has been solved, then who knows? Both of you might become very good friends indeed. When you are working in an organization, you will come across different kinds of employees. Also, you cannot expect them to behave and work as per your wish unless you have the authority to boss them. 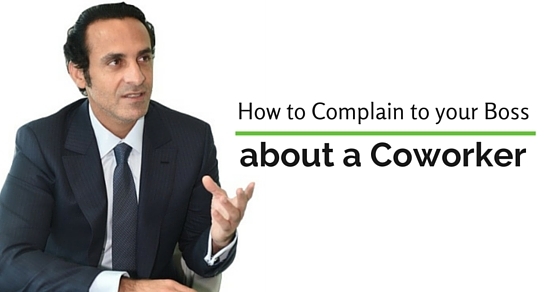 Sometimes few employees turn so annoying and disturbing that, complaining about them will be the only option left. Some of the unethical things they do are eating at the desk, delaying the work to be done, coming late to work regularly, wasting time during work hours etc. Though the things mentioned above are nothing unusual, you can find these in almost every organization. Now the people who are offended by such activities always pick the easiest way to deal with such issues which is to complain about them to their respective seniors who can take necessary actions. Is it best to speak to the coworker rather than the boss first? How to start and What to say? Is the employee problematic to everyone or just me? Will it be pointless to talk to the employee directly? How to approach my manager? What if it is not bothering the business but just me? If you are able to convince yourself by answering these questions, then moving forward with your decision is the right thing. How to Write a Complaint Letter to Boss About a Coworker? When being in the workplace, it makes us introduce to several types of co-workers. And as time passes by, you will be knowing your co-workers very well. Some become our best buddies, whereas there will be few who look little problematic and can even affect the organization in a negative way. Though most of the employees ignore them and mind their own work, there are few employees who cannot tolerate their activities and take the matter directly to the boss. Now, this can be done in many ways like talking to your next senior, talking to your manager directly or by writing a letter to your boss. If you wish to choose the option of writing, then here are a few tips that you can follow to make your letter more effective. Hand out the letter directly to your boss or email him. So these are some of the simple ways in which you can go about telling your boss about the co-worker who is being a source or trouble as well as distress to you. Follow these tips and you are sure to get your point across with no problems at all. Having troublesome workers can really be a source of worry as they completely deviate your mind from the task that is at hand, rather than helping you out when you are in need. A company can become a success only when the employees all come together to work as a comprehensive unit and put their best forward. Previous articleHow to Tell a New Employer about Pregnancy?